Step 1 Cut each apricot into 6 to 8 wedges, discarding the pits. Combine the apricots with the granulated sugar and almond extract in a work bowl and toss well to mix. Step 2 Heat the oven to 400 degrees. Remove the dough from the refrigerator to a flat surface lined with a lightly floured sheet of parchment. Roll the dough into a rough circle about 15 inches in diameter and a generous one-eighth-inch thick. Transfer the dough (still on the parchment) to a baking sheet. Step 3Gently stir in the sliced almonds and raspberries with the apricots. Spoon the apricots into the center of the dough. Fold the outer 3 inches of the dough circle toward the center to make a packet, leaving the inner 4 or 5 inches of apricots uncovered (the assembled galette will be about 9 inches in diameter). Lightly brush the pastry with the beaten egg, then scatter the coarse sugar over the apricots and pastry. Step 4Bake until the crust is golden-brown and the apricots are softened, about 45 minutes. Start checking the galette after 30 minutes, and loosely cover the fruit with a sheet of foil if they color too quickly. Cool the galette 15 to 20 minutes before slicing. In Recipes-list.com we have selected the most viewed recipes from category - Desserts . Enjoy the best recipes specially selected for you! 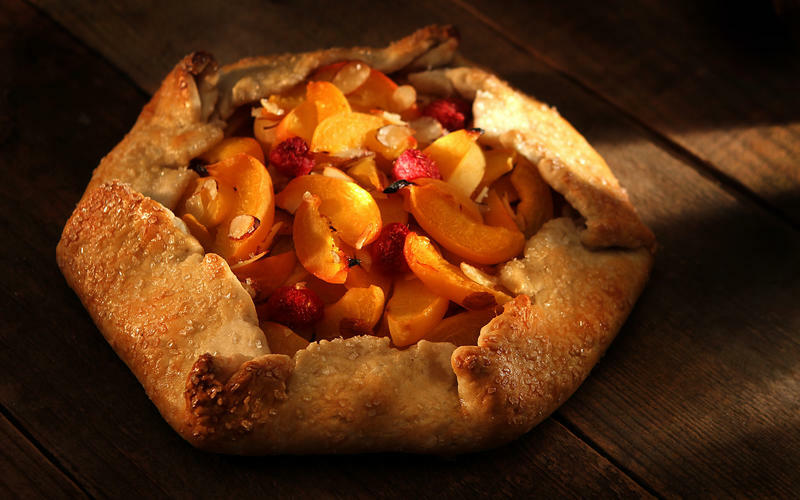 Apricot almond galette is the right choice that will satisfy all your claims.